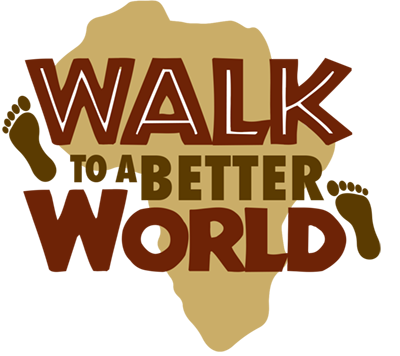 So after months of planning it was time to get the walk underway – 1860km through one of the most beautiful but toughest countries in the world. The lead up to a walk like this in terms of training is never ideal. By the time I got to the start point it had been over a week since I had left home and time for training walks in that time didn’t really exist as we were so busy getting everything ready logistically for the 2 months ahead. 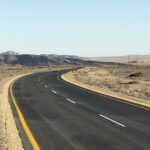 After 3 days in Windhoek where we collected our vehicle, purchased camping gear and stocked up on food, we headed off for the South African border. 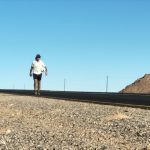 We reached Noordoewer, the border post between Namibia and South Africa, half a day early so decided to kick off the walk ahead of schedule. It was certainly a low-key start to the walk with just Wendy and I there along with some border officials and police looking on. I was excited to get the walk underway and start ticking off the kilometers. 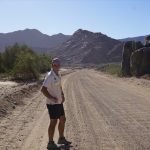 We headed in a westerly direction following the picturesque Orange River that separates probably my two favorite countries in the world. I knew very little about the area but wow weren’t we in for a surprise when it came to the beauty. The river winds through rocky mountains on either side and the water is fresh enough to drink. The mouth of the river is home to some of the world’s biggest diamonds but we would not be following it quite that far. After a day of walking you could be mistaken for thinking you were on another planet. 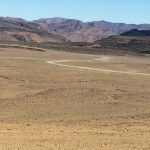 The area was so isolated and barren that it felt like I had just landed on the moon. There were layer upon layer of rocky mountains with little or no vegetation to speak of and just the gravel road that I was following cutting through it. Every now and then the road would dip back towards the river and you would suddenly come across a vista of brilliant blue with greenery of trees and bulrushes in stark contrast to the dull greys and browns of the mountains. Then just as quickly the road would veer away from the river and back into the mountains and again I was on another planet. It’s hard to do it justice in words but I honestly think it’s some of the most beautiful scenery I have ever seen. On the second day we passed through the town of Aussenkehr where we were able to donate a few soccerballs to the local school. Aussenkehr was established as a farm in 1910 and is now used for grape production. It felt a little weird walking through the barren landscape and then coming across row upon row of grapevines. The area gets less than 50 mm average annual rainfall but the vineyard draws water for irrigation from the Orange River and with summer temperatures up to 50°C it is perfect for growing grapes. In fact, Aussenkehr’s table grapes can be harvested three to five weeks earlier than elsewhere, giving them a huge advantage over other grape growing regions in the southern hemisphere. 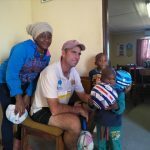 Workers from the vineyards live in shanty towns around a main town center and living conditions are quite basic so I was glad we could contribute balls to the school as just a small token of support. 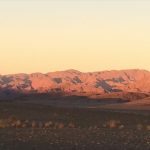 Over the next two days we alternated between stunning views of the Orange River and long sections with barren, desolate rocky mountain scenery on both sides. I have never taken so many photos In my life! 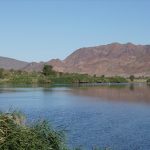 Eventually it was time to part way with the river as it continued west to the Atlantic Ocean and I headed north towards the town of Rosh Pinah. Half way through the fourth day the tiny blister that I had noticed on my heel the night before suddenly became much larger and a matching blister had developed on the other heel. Once they get to this stage there is no choice but to pop them, pump them full of Betadine and dress them with gauze and strapping tape. No time to rest though, and I was back on the road within half hour. 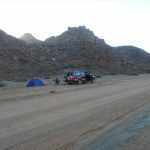 Later that day we reached the mining town of Rosh Pinah, one of the main diamond mining areas of Namibia. They were without power that day due to maintenance work but luckily Wendy managed to fill up with petrol before the generator overheated so we were on our way again. The next section of the walk was up there with the toughest 3 days of my life. Although we were now on a tar road instead of gravel, it was just a long boring straight road that continued to climb steadily the whole way. Wendy walked with me a fair bit of this section as I really needed the company just to get me through it. Then on the 5th day I started to feel unwell. Just a bit nauseated to start with but then the next day I developed diahorea which trust me is not nice when you don’t have access to a toilet. 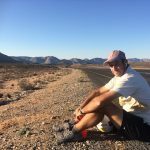 By the time I finally reached Aus on the 7th day I was well and truly exhausted and looking forward to a rest day in the coastal town of Luderitz (a 125km drive away). Luckily we were put up in a nice hotel through a contact at the Luderitz Rotary Club as I would then spend the next two days in bed with gastro. So grateful to the hotel for allowing us to extend our stay and going out of their way to make our stay as comfortable as possible. 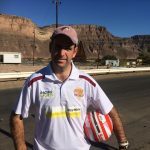 The General Manager of the hotel who is also a Rotary member even took Wendy out to visit some schools so she could donate soccerballs to them on behalf of Mac Millar and netballs on behalf of Soiuth Canberra Netball Association. 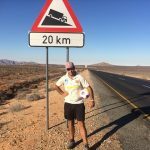 Hopefully will get back on the road in the next day or two as I am really keen to tackle the next stage from Aus to Solitaire and then on to Walvis Bay.